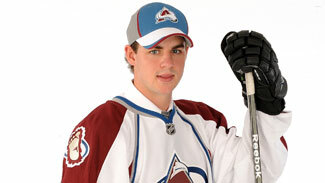 DENVER – Joey Hishon has no grand illusions about following in the skate blades of two other 18-year-old centers who made the immediate jump from junior hockey to the NHL with the Colorado Avalanche. Hishon, the Avalanche's surprise first-round pick (No. 17) in last Friday's Entry Draft, is well aware that it was unusual for both Matt Duchene and Ryan O'Reilly to spend the entire 2009-10 season with Colorado after being selected a year ago. "I know they're both very exceptional players and they did an unbelievable job playing in Colorado," Hishon said. "I know it's a process to play in the NHL, and that doesn't happen all the time. I'm going to go into camp with an open mindset and do whatever I can to stay with the team, but if that doesn't happen I'll look forward to playing in the organization as soon as I possibly can." "I'm going to go into camp with an open mindset and do whatever I can to stay with the team, but if that doesn't happen I'll look forward to playing in the organization as soon as I possibly can." Hishon, who is from Stratford, Ontario, also wants to prove that the Avalanche made a shrewd move by taking him in the first round, a selection that was termed "off the board" by a number of draft pundits. NHL Central Scouting rated Hishon as the 55 th best North American skater, though he was seen as a probable first-round pick before suffering foot and knee injuries that limited his play to 36 regular-season games with the Owen Sound Attack in the Ontario Hockey League. "I think injuries had a lot to do with it, but being named an off-the-board pick, I love it," Hishon said. "I can't wait to prove everyone wrong and show that that's where I belonged to be drafted. I'm very, very excited to be drafted in this organization and I can't wait to get things started. "I did expect to be picked in the first round. I know with the season I had -- I broke my foot and sprained my MCL -- I knew there was a chance that I wouldn't be, but I definitely expected to be in the first round and I definitely believe in my capabilities." But Hishon said he had "absolutely no idea," that the Avalanche would call his name. "I think I sat there for a couple seconds in shock," he said. "I barely even remember walking up to the podium because I was so nervous and so happy at the same time." 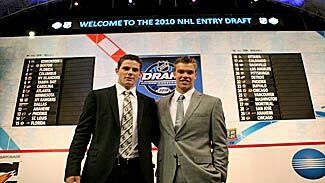 Rick Pracey, the Avalanche's director of amateur scouting, raised some eyebrows when he announced Hishon as the club's top pick because the team already has three solid young centers in Paul Stastny, 24, Duchene and O'Reilly, now both 19. "Having center ice as a strength never became a consideration," Pracey said. "It was always (based on) Joey's skill. We go by skill and ability, and position and needs don't come into play. For us, that's an area where you can really make mistakes in a draft. "The key to our scouting staff is to bring assets to the organization, to provide depth and a high skill level. We really try to stay away from needs. We think we can make mistakes (doing that), and certainly the needs of today are dramatically different years down the road." Hishon, who will need to add some bulk to his 5-foot-10, 170-pound frame, had 16 goals and 24 assists for Owen Sound, along with 26 penalty minutes and a plus-10 rating. He added 4 goals and 3 assists in four playoff games. Hishon was coming off an exceptional sophomore season with the Attack, when he posted 37 goals and 44 assists in 65 games and was named the OHL's best playmaker (beating out O'Reilly and current New York Islanders center John Tavares for the honor) and stickhandler by the league's coaches. It's why Pracey suggested Hishon might have been taken even earlier on Friday if he hadn't been coming off such an injury-riddled season. "I think the injuries certainly played a factor in perhaps the amount of times that people saw him play," Pracey said. "If coverage is lacking, that can affect peoples' ability to get a good read. We were aware of his ability for two years prior to this draft. I can't speak for other teams, but certainly an injury that takes a good chunk of the season and being limited to 36 games, that probably helped us. "We think Joey is an offensive player with instincts and the ability to make plays. He plays a strong puck-possession game at a high skill level and is very competitive. This is a player who wants the puck on his stick, is very intelligent out there and makes other players better." Pracey said he didn't expect Hishon's smallish size to be a problem in the future. "Certainly Joey has to put on a little bit of strength to get bigger in terms of weight, but that's all part of the development process," he said. "If you look at the board and at the draft … there were players in the 5-(foot-) 10 range that went prior to Joey. I think it's just an indication this League is about skill. Size was not an issue." Like Duchene and O'Reilly, Hishon played for Canada at the 2009 Under-18 World Championships, and he's friends with both. "They're two very exceptional hockey players and if I can accomplish half the things that they'll accomplish in their careers, I'll be more than happy," he said. Aside from talent, the Avalanche was drawn to Hishon because of his character. Despite breaking his foot while blocking a shot against Niagara last season, Hishon remained in the game and scored the winning goal. "That was a big draw for us," Pracey said. "He's a character player that not only makes people around him better, but he's a guy that comes to play. His wanting to be a puck-possession player and wanting to impact the game was very, very important to us. "We think it just speaks to a lot of the reasons why we like him as a player. He's a skill guy and a very important player on a team when he's getting in front of pucks and doing those little things to be something special." Hishon was involved in a "Hishon for Hodgkins" campaign after Brittany Taylor, a Stratford native and the teen-age daughter of former NHL player Tim Taylor, was diagnosed with Hodgkins Lymphoma. Stratford-based Hyde Construction donated $150 for each goal that Hishon scored at home and $50 for each assist, with the monies going to the Canadian Cancer Society in Brittany's name. That shouldn't come as a surprise because Hishon describes himself as "a small-town kid from a hockey family." He got his start in the sport at age 4 skating at the Stratford rink where his dad, Joe, works. His mom, Sue, is an administrator with the Minor Hockey Alliance of Ontario. "So it's hockey, hockey, hockey for my family," he said. "My family has been very supportive of me my whole life." Hishon acknowledged he'll no longer be quite as supportive of the Toronto Maple Leafs, the team he rooted for while growing up in Stratford. "Now I think my favorite team has changed to the Colorado Avalanche," he said.